First things first: the white belt. The white belts generally used at the beginning are rather cheap and of poor quality, sometimes not even overstitched, given by the club or purchased from a sporting goods manufacturer. The problem is, that these belts are mainly designed for Judo or Karate, where the white belt is rarely worn longer than a few months. However, the fact that there are no colored belts in Aikido (for adults), means that the white belt has to last for 3, 4 or 5 years. Rather than replacing a for Aikido unsuitable and short-lived white belt several times, it would be wise to start immediately with a quality belt! Yes, but! Unfortunately, there are very few white high-grade belts designed for Aikido, and 99% of white belts are made either in China or in Pakistan. As far as I know, there are only 3 or 4 brands that offer white belts manufactured in Japan, belts that last for several years, made by Aikido brands, because finally only in Aikido one needs a white belt of good quality. Soft White Belt - Designed for Aikido ! Obviously there is also the question of the thickness, but I will talk about this later in the article, because this equally concerns the black belts. Again, this is rather rare. Only in Aikido and martial arts related to it, a thick "Judo type" belt is worn under the Hakama. In Iaido, you use a Iaiobi (wide and thin belt), in Kendo, no belt, and in traditional Koryu either a Iaiobi or the belt is worn over the Hakama (yes, this exists!). Wearing a Judo belt under a Hakama poses two different problems, which show differently depending on the practitioners body shape. If you are relatively thin, which is quite common in Aikido, you will have the problem, that the belt slips upward as soon as you start practicing. The belt is no longer fastened, the Hakama not attached properly and after 20 or 30 Ukemi the mess is perfect. There is indeed no ideal solution to this problem. However, a thinner belt, better matching the shape of the hips can help. Be it a classic overstitched (but flexible) belt or a wide Iaido belt. The second problem is the pain that a belt can cause during falls. Two layers of a rigid belt, this can quickly bruise one's hips. Therefore, a semi-rigid belt might be a good solution. If you are rather well-built, the first problem is of less importance. If the waist is larger than the hips, the belt will stay in place. Nevertheless, depending on the height you wear your belt, it can still be uncomfortable and painful. The Iai Obi proves to be the solution to that. Determined by the cotton core and the number of stitched rows on the belt, the flexibility is the second important point when it comes to the choice of the belt. The softer the belt, the smaller and tighter the knot and the more comfortable during falls. In return, it might be less good looking, which is, because worn under the Hakama, of little importance. On the other hand, if the belt is too thin, it does not properly keep the Hakama in place - and here we go again. Again, depending on your body shape, a rigid belt may not be a problem, but generally spoken a belt that remains relatively soft is better. The third important question concerns the length. If you opt for an embroidery, you most likely want it to be visible, making it necessary to have a fairly long belt, that can again be uncomfortable during falls. Do not hesitate to choose a rather short belt, so that each end just reaches the hips. The ideal size for this can be calculated as follows: 2 x waist circumference + approx. 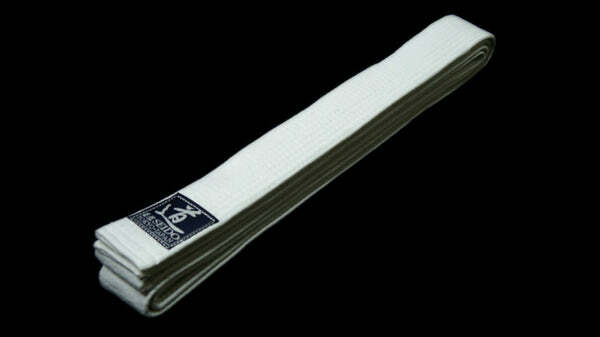 80 cm (for Judo, belts are usually a bit longer, around 90 cm. And for Karate, even longer, around 100 cm). If you wear a thick jacket, it is worth taking the waistline over the jacket. The second question of importance. The width of the belt determines two things: comfort during falls and the size of the belt's knot. The larger the belt, the bigger the contact surface with the mats during falls and the less painful the impact. On the other hand, a wide belt also means a wide knot, which is not very aesthetic under the Hakama and further rather uncomfortable for techniques on the ground, while being Uke for Ikkyo for example. Most Judo belts are 4.5 cm wide. The least wide belts are 3.8 cm and the widest ones are 4.7 cm. There is no ideal choice, but let us say that for Aikido, the width would be between 4 and 4.5 cm. 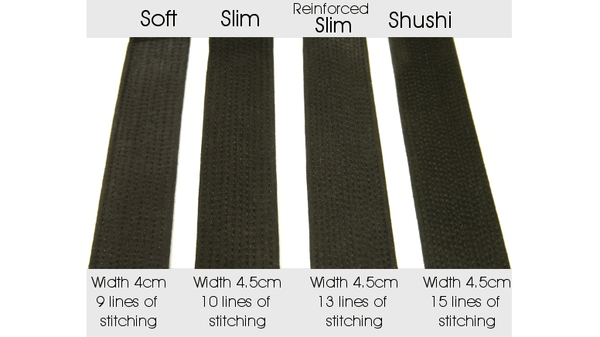 Generally of a width of 6 to 8 cm, a Iai Obi has many advantages. It stabilizes the hips, which improves the sensation of the centre, it supports the lower back, and keeps the Hakama in place if tied correctly. However, it is less "classy" than a Judo belt, and not ideal for embroideries either. Moreover - big trouble - a Iai Obi should only be worn with a Hakama especially considered for it. The classic Aikido Hakama are cut to be worn with a classic belt. In other words: the front and back straps are at about the same height. Even with a wide Obi, the back plate has to sit on top of the belt, and therefore the back part of the Hakama needs to be cut longer (about 3 to 4 cm) - or, in other words, the front straps have to be lowered, so that their height reaches just the base of the backplate when the Hakama is folded. Unfortunately, this type of Aikido Hakama does not exist as such, and it is necessary to opt for a custom made product. (We offer this option even for Classic Hakama , except for the Keiko model, that can not be customized). What Aikido belt do we recommend? In general, a belt that is flexible, and not too thick. We have designed two models, available in black and white, plus a wide Iaido type belt, also available in black and white. Aikido Soft Black Belt and Aikido Soft White Belt : featuring a width of only 4 cm, this model is the most flexible possible, regarding overstitched belts. Aikido Slim Black Belt and Aikido Slim White Belt : featuring a width of 4.5 cm, a more resistant Judo type belt yet, relatively thin and soft. 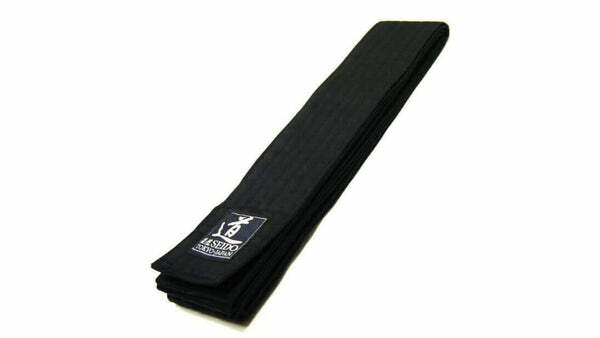 Aikido Wide Black Belt (Iaiobi) and Aikido Wide White Belt (Iaiobi) : featuring a width of 6.3 cm, extremely thin, but overstitched (which is rare for a Iaido type belt) to give it a bit more strength. These models are the most adapted for Aikido - in our opinion. However, we know that foreign practitioners are used to quite thick Judo belts. Therefore we offer also the model "Reinforced Slim Black Belt", still narrow, but stiffer with 3 extra lines of stitching, and a "Satin" model, that is close to a classic Judo belt. And if you have other questions, feel free to comment this article below !